Why choose a window shutter fitting service? Looking to install shutters yourself? 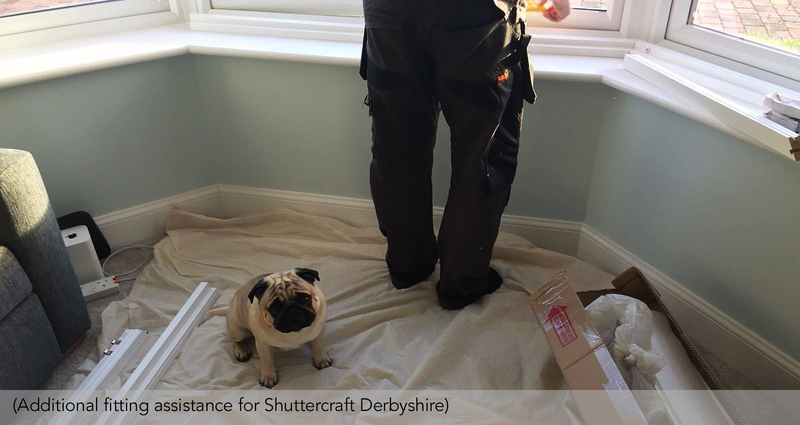 Selecting a company to come into your home can seem daunting at first, but with friendly fitters like those at Shuttercraft, you can rest assured of a quality fit every time. Rather than off-the-shelf alternatives, interior shutters are a made-to-measure product that breathe new life into your living space. Unlike new curtains or blinds however, shutters can require detailed installation relying on technical know how, to ensure they last for years to come. At Shuttercraft, we pride ourselves on our friendly and thorough approach. We take our shoes off when entering our home, tidy up after we’re finished, and guide you through the proper maintenance and upkeep of your shutters. We value the sanctity of your home: it’s your space, and we want it to look its best, just as you do. What is a shutter installation? How long does it take to fit shutters? Could I fit the shutters myself? What is the Shuttercraft Difference? What do our customers say about the quality of our work? Window coverings can’t usually be used for other purposes around the home, but plantation shutters are popular choice as they can. As well as offering effective light control, they can also be used as room dividers or wardrobe doors, as an example. Although there are guides available online showing you how to install plantation shutters, these are to be approached with caution if you are considering doing it yourself. The products can end up being damaged because of being poorly fitted. Usually comprising both a frame and panels, installing a shutter needs to be carried out with precision, or else there are likely to be issues with operation. How to fit shutters in seven steps! Special shapes, tracks, tier-on-tier and bay window installs will obviously require more steps to be followed during the fitting. Adjustments and amendments may also need to be made to ensure the install is carried out to the highest standard if the initial measurements were incorrect. This is why it is a much safer alternative to rely on trusted shutter installation services offered by companies such as Shuttercraft. From arches, bays and portholes to gable ends, skylights and conservatories, there are almost countless window types found throughout the home. Throughout history windows have been a key architectural feature that help admit both light and air, and have developed in style and design just as tastes have shifted from generation to generation. There are a whole variety of inventive window designs included with modern property design, and shutters prove to be an elegant finish for the vast majority. From tiny portholes to vast gable ends, windows can come in all shapes and sizes, but as our shutters are custom crafted, we guarantee there will be a solution for you. Your window and surrounds will guide the way that shutters can be installed, but with so many style, colour and material options, you can have your choice of design to suit your personal style. Shutters can be fitted to almost any interior window both inside or outside the recess, so long as the fixing surface is secure. Even spaces with damper environments like bathrooms won’t present a challenge to the shutter treatment, as they can be produced from waterproof ABS, a hardwearing polymer. Fitting shutters to uPVC windows requires a little more skill, but can easily be carried out by the professional installer. Many customers opt to match the hardened thermoplastic of ABS with uPVC in areas prone to condensation and damp. If you have standard windows then there’s a shutter solution to suit your needs. Even if the fixtures of your space are a little out of the ordinary, it’s well worth exploring the options with your local Shuttercraft expert, as we fit to almost every type of window out there. Knowing how to install interior shutters will give you a better idea of how long an installation will take. Experienced shutter experts will of course be more skilled and knowledgeable than your average DIY enthusiast. There will always be a number of factors to consider, such as the shape/size of the window, fixing surfaces, frame elements, and track components. Larger windows or spaces can often take longer to fit, so this will also need to be considered if you’re planning to have them installed in your home. During an initial (free) survey, your local Shuttercraft expert should be able to give a rough indication of the amount of time required for any project. 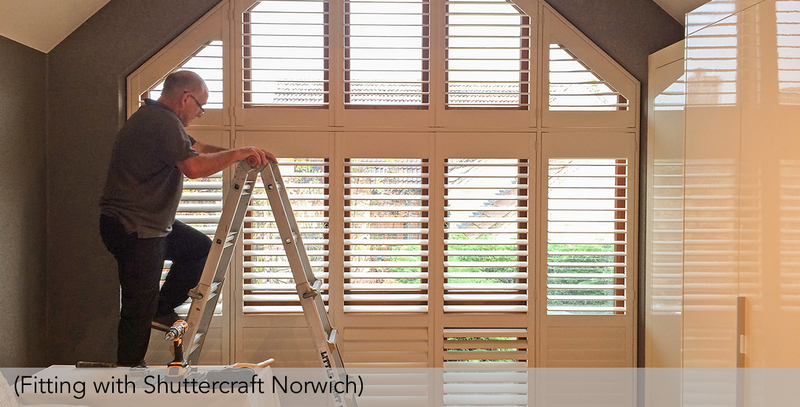 Smaller jobs can take just a couple of hours, but to ensure your shutters are fitted with precision, larger jobs or entire houses might take a day or more. Shutters are manufactured using precision joinery techniques such as mortise and tenon joints. With shutter elements such as tilt rods, there are additional skills that need to be used to attach them correctly. When it comes to the installation of the shutter frames and panels, we recommend you use a trusted local company, such as Shuttercraft. No matter how good your DIY skills, you can’t beat fully trained professionals with specialist knowledge. It’s also worth remembering that incorrect fitting may invalidate the manufacturer’s warranty. Fitting shutters to sash windows, bays, or installing track mechanisms can be technically demanding, so it’s important to weigh up the potential problems caused by unprofessional installation against the additional cost of fitting. For what is often only a one-off project, learning an entirely new skillset will prove a stretch for many, given the time it’ll take to learn. If you’re considering a do-it-yourself approach to shutters, you’ll be aware of the level of detail required when measuring. It’s why a made-to-measure shutter from a trusted company such as Shuttercraft is the most reliable option. We offer the full package, from accurate measurements and competitive quotes through to skilled fitting and aftercare. DIY shutter kits are available from many online retailers, but can be tricky to assemble, so aren’t always suitable for novices. With Shuttercraft you can rely on the fact that your shutters will look their best for years to come. How about special shaped shutters? At Shuttercraft we believe in made-to-measure, which is why we only supply custom-made shutters. This means nearly every shape of window can be finished with a shutter – from ovals and circles through to triangles and of course more usual rectangles and squares. Interior shutters are also an incredibly popular choice for arched windows and angled gable ends, fitting the unique contours in a way that other solutions cannot. Architects like to make a visual statement with their designs, and it is only natural to want to provide some privacy and light control through even the most unique openings. Special shape shutters are individually crafted to suit the space, emphasising the beautiful features of your home, and providing an alternative when curtains and blinds simply won’t work. We want your Shuttercraft experience to be a happy one. Not only due to our impressive range of shutters and materials, but also the care we show you, from your first contact to the finished result. We know it’s vital to trust anyone who comes into your home, and that you’ll want the job done right first time. It’s only by understanding our customers’ insights and experiences that we’re able to deliver on their expectations, time and again. If you choose to place an order, we’ll make sure to arrange a convenient time and date. On completion of the install we’ll explain how to operate and maintain them, and make sure your home is as tidy as before we arrived! Shuttercraft customers all over the UK have repeatedly commented on our professionalism, attention to detail and expert knowledge. You care about your home, and we care about getting you the right shutters, in a way that suits you, through every step of the journey. 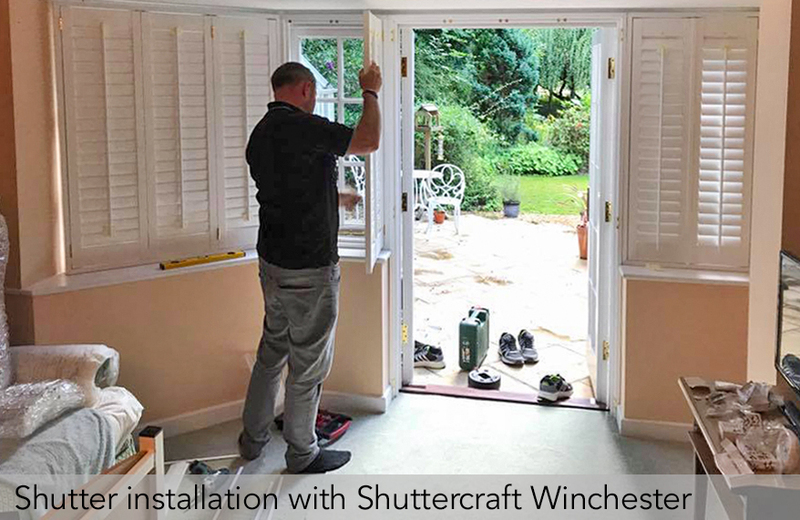 At Shuttercraft we pride ourselves on being shutter experts, and this extends to our installation service. 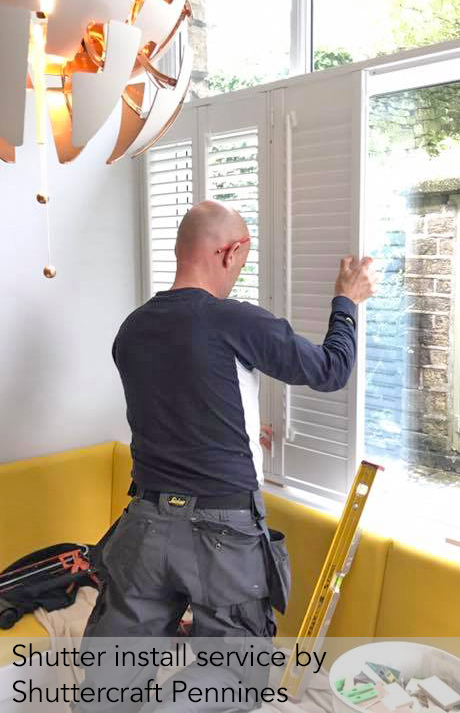 With a keen eye for detail, our fitters will take the various shutter elements and assemble them in situ or nearby, ensuring the shutters are firmly fixed to prevent damage. Here is just a sample of what people have said about Shuttercraft; you can find more by checking reviews and testimonials on our websites, Facebook, Google, Checkatrade and Trustpilot. 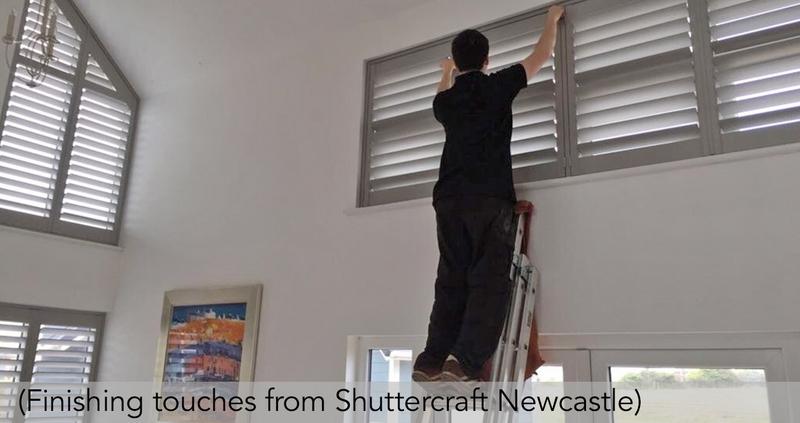 If you’re thinking of revisiting your interior designs, Shuttercraft has both the experience and skill to deliver the perfect shutter solution. We help you choose the right materials, colours and styles to suit your requirements and breathe new life into your home. Find your local Shuttercraft today and let us make light work for you! Call us now on 03304 004 144 and speak to us about your requirements.